Now deleting any send WhatsApp message is an easy task, but how do you done this job? Most of the person want to how to delete WhatsApp message which you’ve already send accidentally to any particular WhatsApp number or group. WhatsApp recently launched his latest feature which allows you to quickly delete WhatsApp messages. Sometime during sending the messages you feel a message send to any broadcast group or any individual person by mistake. Before few days ago there is no change to delete this messages if you don’t have admin right on WhatsApp group. You can delete any sent WhatsApp messages from particular person WhatsApp number only. But after releasing this latest feature you can easily delete a WhatsApp messages which you have already send to others. If you accidentally sent any WhatsApp message to a particular group or any person then you can easily delete them from one or everyone phone. To do this job you have to take few simple steps. Step 1: Download and install latest WhatsApp version at your smartphone. Step 2: Type and sent any message to any broadcast group or any particular WhatsApp number. Step 3: If you want to delete the message on WhatsApp then tap and hold the message. Now you will get few options on your WhatsApp screen. Delete for Everyone allows you to delete any text messages, videos, images, GIFs or documents on WhatsApp. 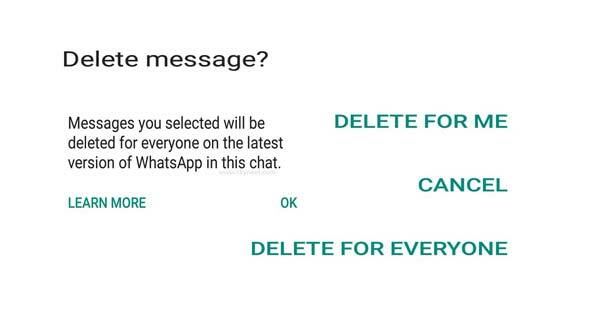 If you want to delete sent WhatsApp message then you have to choose “Delete for Everyone” option. Now you can view another message window which shown selected message will be deleted fro everyone if they have latest WhatsApp version. Step 3: Finally tap on the OK button. After delete the message you can view a message “You deleted this messages”. This message is shown in group or other WhatsApp user screen. Note: If recipient has already read the WhatsApp message then there is no way to force him to forget then seen message. It’s too late if two blue ticks appear at your screen. This feature works properly on both iOS and Android.